The Minnesota Vikings enter the game with a perfect 3-0 SU and ATS record, something few would have thought possible when they lost Teddy Bridgewater to a season-ending injury. In came Sam Bradford who is doing just enough to move the ball and Minnesota has been able to win thanks to defense and special teams. The New York Giants are 2-1 on the season with the defeat sustained last week in a 29-27 home loss to the Redskins as a 3-point favorite. Close to 60 percent of the wagers have come in on the Vikings, and the money has moved the line accordingly from the opener of Minnesota -3.5 to -4 and even -4.5 at some shops. The total has dropped half a point from the opener of 43 despite a majority of the tickets coming in on the over. New York eked out a pair of narrow victories over Dallas and New Orleans before blowing a 12-point lead against the Redskins in Week 3. The Giants had little problem moving the ball and amassed a total of 457 total yards, but Eli Manning had two costly picks and the Giants committed 11 penalties for a total of 128 yards. Manning has a completion rate of 71 percent and a total of 925 yards passing, but he’s thrown just four TDs while getting picked off three times. The Giants lost starting running back Rashad Jennings to a thumb injury in Week 2 and backup Shane Vereen, possibly for the season, with a torn triceps last week. It will be 24 year old Orleans Darkwa’s responsibility to carry the ball tonight. The Giants sure seem to have respect for the Vikings, and rightly so. Last season, the Minnesota Vikings destroyed the New York Giants 49-17 here at Minneapolis in a December matchup, but they won’t have to worry about star running back Adrian Peterson this time around as he’s sidelined indefinitely after undergoing surgery to repair a torn meniscus in his knee. The Vikings are 7-0 ATS in their last seven home games vs. a team with a winning road record but 0-7 ATS in their last seven Monday night games. Giants are 1-4 ATS in their last 5 games overall. Giants are 8-1-1 ATS in their last 10 games in Week 4. Giants are 1-4 ATS in their last 5 games following a straight up loss. Vikings are 36-15 ATS in their last 51 games overall. 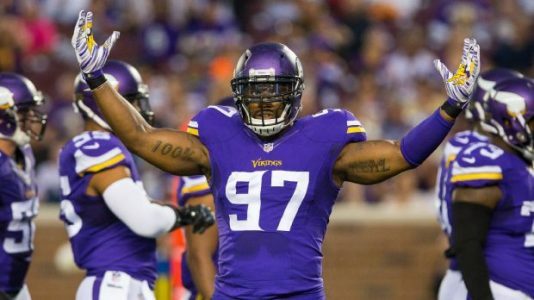 Vikings are 4-0 ATS in their last 4 games in Week 4. Vikings are 16-5 ATS in their last 21 games following a straight up win. Over is 5-2 in Giants last 7 games overall. Favorite is 4-0 ATS in their last 4 meetings. Giants are 5-2 ATS in their last 7 meetings in Minnesota. Road team is 7-3 ATS in their last 10 meetings.